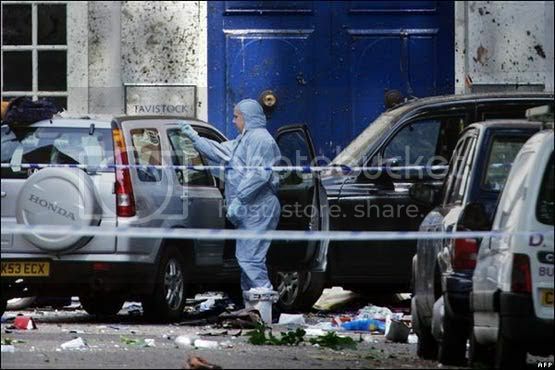 Can any of you tell me what are the odds of a so-called "suicide-bomber" ending up blowing himself and a bus up - when the bus had been diverted from its normal route and ended up "lost" in Tavistock Square...right outside Fortress GB in Tavistock House, and that the "blood of the sacrificed" would end up spattered right on the lintels of the entrance to the original Tavistock Clinic from where the Tavistock Institute emanated, like a Satanic "passover" ritual? "London's four suspected suicide bombers had wanted to to scar the city with a ``burning cross'' of blasts in its north, south, east and west, in the hope of being declared Islamic martyrs ... The four suspects were caught on security cameras at London's Kings Cross station, heading off in different directions shortly before the three bombs went off near Aldgate, Edgware Road and Russell Square Underground stations early last Thursday. A fourth bomb exploded on a bus nearly an hour later." "Police suspect three of the young men carried bombs east, west and south, while a fourth had planned to take the north-bound Northern Line, but, as this was disrupted, he changed plans and boarded a bus, London's Evening Standard said." One Cutting Edge researcher had noted some interesting facts about the bombings as she plotted the actual bombing locations. Please now look at this map carefully, above. 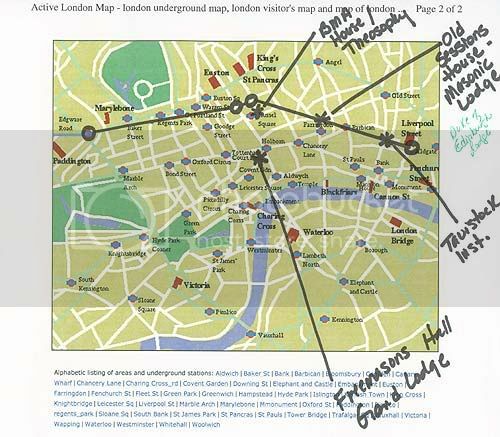 The circles drawn on the map represent the four locations at which the bombs went off, while the asterisks ( * ) depicts locations of interest. 1) Note that two of the bombs went off just south of the King's Cross subway station. This Australian news article, above, further states that the four bombers met King's Crossing subway station with the plans to head off in opposite directions. The bombers did get their explosions off to the east and west, but not to the north and the south, as this article states was their original plan. Obviously, explosions would have had to be set off directly north and directly south of King's Cross for a "burning cross" to be etched on the ground. In this regard, I find it interesting that initial reports indicated that as many as six, and possibly seven, bombs had exploded. For a "burning cross" to have been created on the ground by these explosions, three more would have been ideal. Was that the plan, and were the other three bombers inhibited by chance circumstance from exploding their devices? We shall never know. 2) Notice the the British Medical Association headquarter building lies just across the street from the King's Cross explosion. As we explain in NEWS2054, this building was originally built by the Black Magick secret society, the House of Theosophy, as their headquarters. Because one of the bombs exploded very close to the location of such an occult location, fellow occultists throughout the world would have instantly recognized this location as highly symbolic. 3) Notice that just to the right (East) of the first bomb the Old Sessions House is located. This building is a major Masonic Lodge. 4) Just East of Old Sessions House lies the Tavistock Institute, home of the infamous Mind Control experiments since World War I. We explain this very important connection also in NEWS2054. 5) Notice that directly south of Bomb #1, and directly south of King's Cross station, lies the Freemason's Hall, the Grand Lodge of England. Had a bomb exploded close to this location, a southern point would have been established to create a "burning cross" on the ground. Only one more explosion would have been needed, northward of King's Cross station. Toronto the next terror target? Lenny Bloom at Cloak & Dagger has a really weird post about the above illustration which appeared in the July 10th edition of the Toronto Star. * The streets listed are York and Toronto, meaning the viewpoint could be from as far north as Queen Street, another clue. * The bird appears to be flying into the Skydome. * The dates listed are August 31- September 1st, which is when the Balitimore Orioles play the Toronto Blue Jays on these very same dates. I am waiting to find a hi-res image of this illustration, but there appears to be a black bird flying in the illustration. The view seems to be from north of Toronto (have a look at this google map to see if my orientation is right). Lenny doesn't understand what the number 4701 on the trolley means. It is a trolley car associated with the Dundas West Station, which has been undergoing some construction recently. These are just some of the hints that Toronto is next. Recently, Peter Power, manager of Visor Consultants, the company who ran the terror drills during the London Bombings was in Toronto, where he met up with the likes of Anne McLellan and Julian Fantino. Who knows what was discussed. "What is interesting is that he seems to have business connections to Giuliani, who was in London at the time of the bombings (the connection was through the Canadian Centre for Emergency Preparedness which, by happy coincidence, held its World Conference on Disaster Management in Toronto from June 10 to 13). " Do these subtle clues hint at a terrorist attack at the end of the summer? I certainly hope not. But it's important to take down this information and chronicle it in case such an occurence actually does happen. NOTE: This material was prepared BEFORE the events that occurred at the World Trade Center and the Pentagon on the 11th of September, 2001. Those events cannot help but accelerate the processes described below. Under cover of "protecting the country against terrorism," we are about to witness the most powerful and sustained attack against civil liberties that any modern, civilized people has ever before suffered through; an attack so vast and enormous that even the so-called "Red Scares" of 1919 and 1947-1954 will pale in comparison - and an assault fiendishly designed to curtail the witness of true Christians everywhere while all the time pretending to be on the side of Christianity. 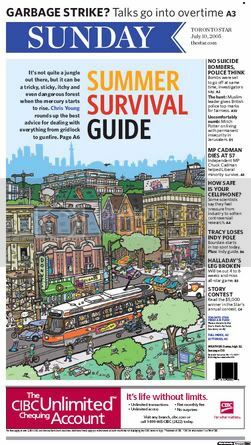 Bombing tip-off in Chigago Tribune? "1901. After going bankrupt building a Chicago elevated transit line, Charles Yerkes WENT TO ENGLAND AND BUILT THE FIRST SUBSURFACE TRANSIT LINE IN LONDON THAT EVOLVED INTO THE CURRENT UNDERGROUND TRAIN SYSTEM." Downing Street Memo? What 'Downing Street Memo'? Words heard all across the media today.